Imogen's Typewriter. 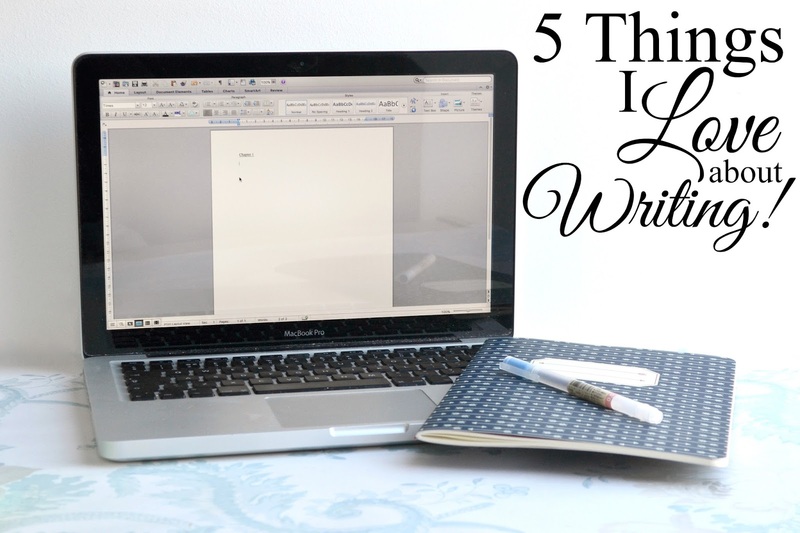 : 5 Things I Love about Writing! Lately I've been working on my novel, and I've been having so much fun with it. But I feel it looming, the dreaded Writer's Block. So to keep myself pumped up and ready to beat any opponent in my way, I thought I'd write down 5 Things I love about writing to remember in the future and keep this streak up! 1. Getting the world in your head down on the page! Sometimes I'll sit there and it feels like an entire universe in my brain and I have so many thoughts on what I want to happen to my characters, there are scenes that run around my head for days. So writing it all down on paper or screen is amazingly freeing. 2. Hitting the Sweet Spot! While I believe in writing even if you don't feel like it, even if your mind is blank, even if you have nothing to say, I also believe that there is a sweet spot that every writer hits once in a while. When everything is just right and the words flow from your fingers that by the time you hit the end, you've written more in one session than the rest of the week. 3. Finding that perfect writing song! I cannot tell you how many times I've paused a TV show or movie to Google the song playing because you just know it's perfect. You listen to it and you can see your characters lives that much clearer. Personally, I find myself listening to a lot of original soundtracks; Lost, The Walking Dead, The Social Network, Lord of the Rings, or songs that I know the lyrics so well that it doesn't get in the way of the words in my head. 4. Reaching a Word Count goal! Word count is my nemesis. I believe that if you can say something in five words, don't stretch it out to ten. *side-eyes certain books on my shelf* But this can make any work I write pretty short, and fast- which is something I'm working on because some scenes really need slowing down- so reaching word count goals feels awesome! 5000 words? Amazing. 10000 words? Incredible. 50000 words? Unheard of so far but I'm hopeful. Stephen King, who wrote my favourite book about writing, says; "Write with the door closed, rewrite with the door open." And JK Rowling has been quoted saying; "I find that discussing an idea out loud is often the way to kill it stone dead." But. Sometimes there's nothing quite like sending a snippet or a plot idea to a friend and getting a nice response. Even if they're lying. Constructive criticism is for the editing process! Do you write? What do you love about it?